Mobile ordering will be available in late 2017 at McDonald’s and Wall Street is happy with the thought. Shares of McDonald’s reached a new all-time high last Friday and are up close to 10% during 2017. McDonald’s has been enjoying a strong comeback since March of 2015 when Steve Easterbrook took the reins as CEO. He moved to revamp the menu at the Golden Arches and focus on technology like in-restaurant self-ordering kiosks. The new changes paid off quickly, with McDonald’s posting solid gains in sales for much of both 2015 as well as 2016. However, sales begin to cool off some of recent in the U.S. but investors apparently are not alarmed. McDonald’s will post its most recent quarterly results Tuesday. Sales at the company are strong in a number of markets overseas and the talk about have mobile ordering has many analysts excited. USA President of McDonald’s Chris Kempczinski in March told investors the company was planning to start mobile ordering as well as curbside pickup options in all of its restaurants in the U.S. by the 2017 fourth quarter. The company has also been testing a new delivery services in different markets in Florida through mobile ordering with UberEats. A pair of analysts upgraded stock at McDonald’s last week due in a large part to the increased expectations over the mobile push by the company. Several analysts raised their targets for the McDonald’s stock price. Starbucks said during its last report for earnings that the long lines to purchase drinks had been scaring off clients who did not place their orders in advance. However, analysts argued that, that is a good problem for a business and that McDonald’s could learn from the growing pains of Starbucks. Digital ordering, said one analyst would also help the burger chain due to it allowing for more customization while also improving the accuracy in ordering and enhancing the overall customer experience. One other analyst said that he thinks mobile ordering could become a big hit for McDonald’s. He said in his survey of franchisees on McDonald’s that many are very excited over the new technology opportunities. 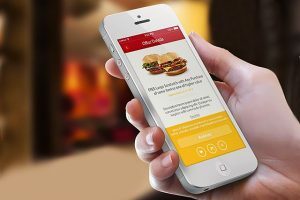 There is without a doubt a need for mobile ordering due to the current smartphone generation, said one franchisee that the analyst had surveyed. The analyst said that the younger customers avoid quick serve establishments because they do not have technology and they do not like dealing with so many people.